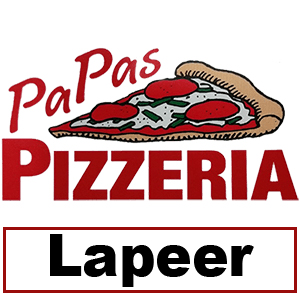 Online ordering menu for Papas Pizzeria (Lapeer) . Papa's Pizzeria is a Traditional Brick Oven Take-Out Pizzeria specializing in a variety of unique Pizza creations, as well as Breads and Wings. We use only the choicest meats, finest cheeses, freshest ingredients, and hand tossed dough to create authentic and delicious meal experiences. Papa's Brick Oven pizzas and specialty items stand out from the competition, and that's by design. Order online today for carryout and come visit us. We are located Just North of the Lapeer County Courthouse and Anrook Park.